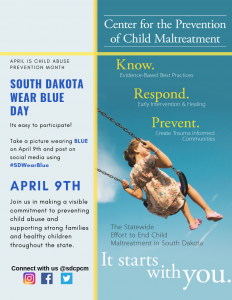 More than 4,000 South Dakotan children from all socio-economic and race groups experience sexual abuse every year. 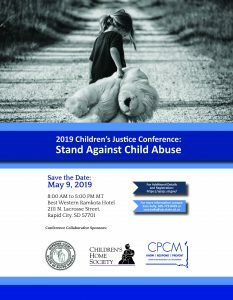 The Center for the Prevention of Child Maltreatment focuses on delivering education, outreach and research geared toward eliminating child sexual abuse and maltreatment in South Dakota. Whether we’re training mandatory reporters, helping victims and their families navigate the criminal justice system or providing data analysis assistance to state agencies, we’re committed to stopping the cycle of child abuse. Report child abuse or neglect. DSS Intake Specialists will be available from 8 a.m. to 5 p.m., Monday through Friday. If reporting before 8 a.m., after 5 p.m., on the weekends or during a holiday, please contact local law enforcement. Always call 911 if a child is in immediate danger!